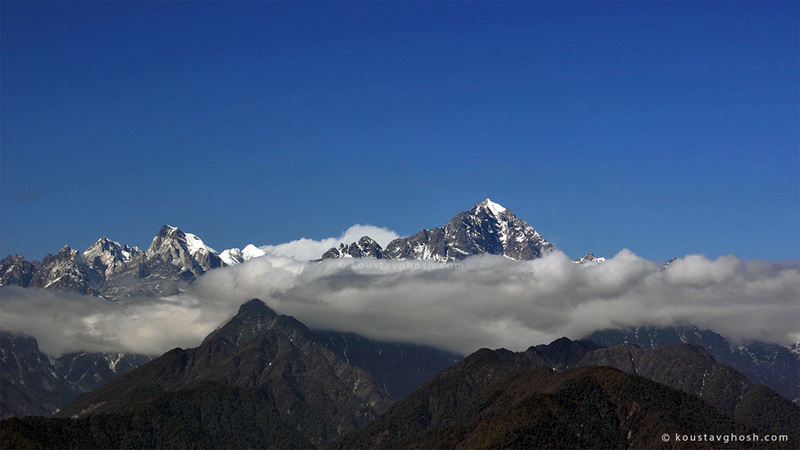 Situated within 6 KM from Ravangla in South Sikkim, Ralang gives you a clear view of Kanchenjunga, the third highest peak of The Greater Himalayas. 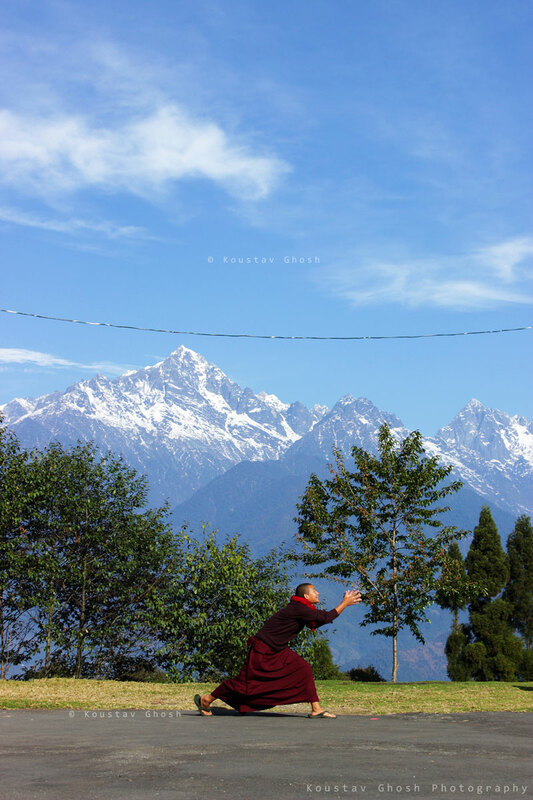 While in Ravangla you find peace and serenity, Ralang will offer you an experience of the life and culture of Buddhist monks. Perhaps December is one of the best times to visit Ralang because at this time they observe their harvest festival ‘Kagyed’. 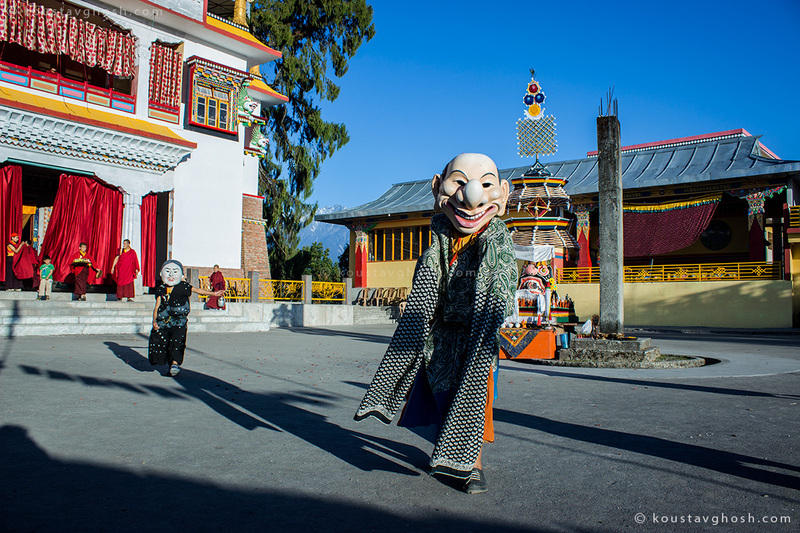 Here the monks wear different masks and perform ‘Cham’ dance. 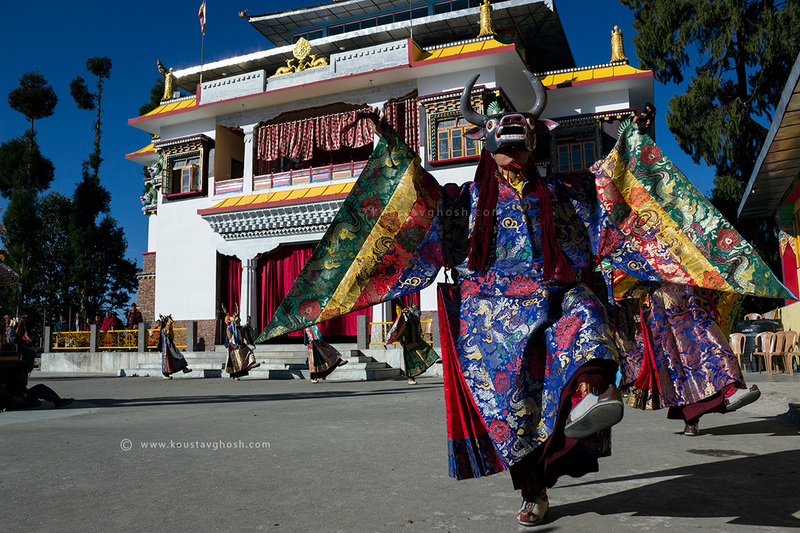 ‘Cham’ is a type of dance found in Sikkim. The performers wear different type of masks and portray a visual drama through their dance. In Cham they worship Mahakala, who is a protector. 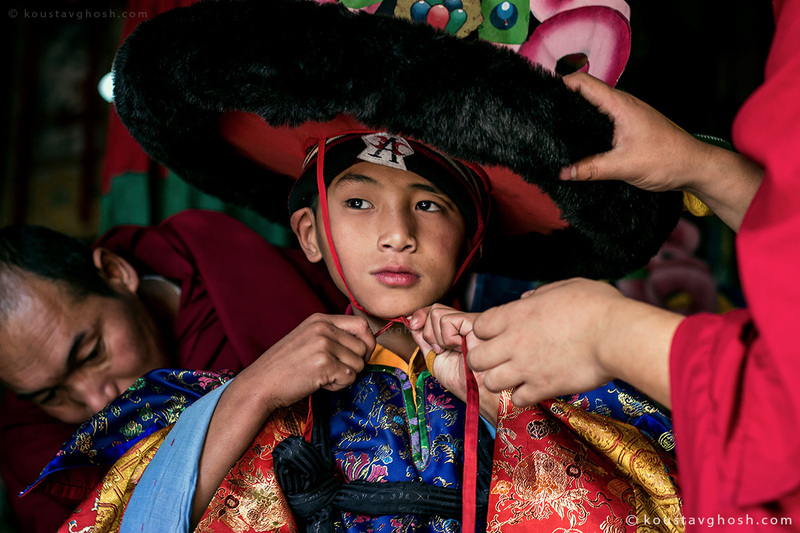 After spending two days in Ravangla, Anirban da, Rimbik and I headed for Ralang to see the Kagyed festival and Cham dance. We took a cab and it took nearly 1 hour to reach there. The temperature was cold enough to make us shiver. A very generous monk helped us to find a room near the old Ralang Monastery. We wanted to experience the preparation of the Kagyed festival. They gave us permission to roam around and to photograph. We were very happy for their kindness. 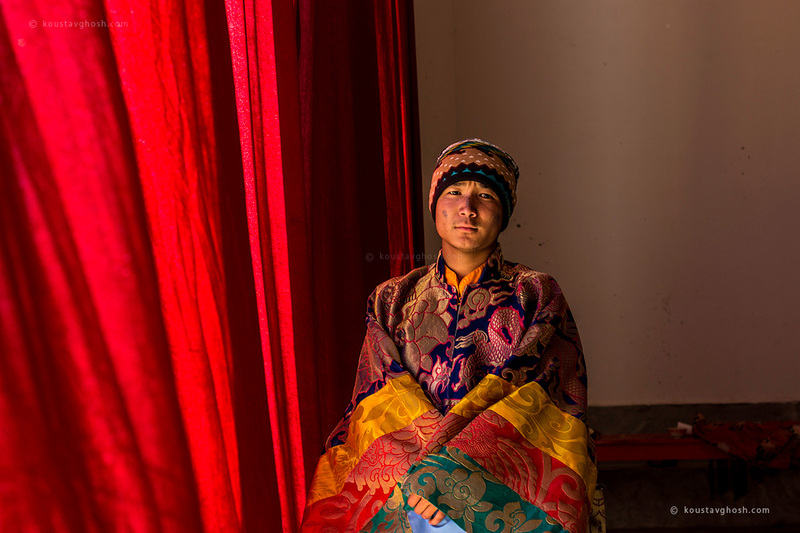 The Kagyed festival happens in Old Ralang Monastery in Ralang. During the time of festival many food stalls, different shops are installed temporarily, it looks like a small fair. We had our dinner in such a food stall. We had momo and soup. Some locale were enjoying local alcoholic drinks made from some local herbs. After our dinner we decided to go and watch the preparation inside the monastery. It was around ten o’clock. The atmosphere inside of the monastery was amazing. 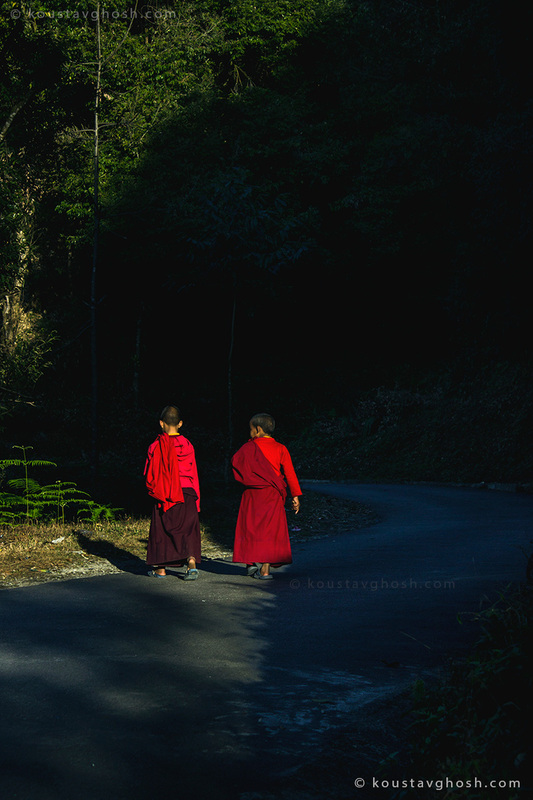 From young to old monks, everybody was chanting. They recited through the night with a very few break for food. The light inside the monastery was low. I took couple of photographs there. At around 1 am I thought of having some rest for myself. I needed some sleep as I have to photograph the event from next morning and I didn’t want to miss it. I slept for 4 hours approx. I woke up at around 5 am. The sun had not yet risen. 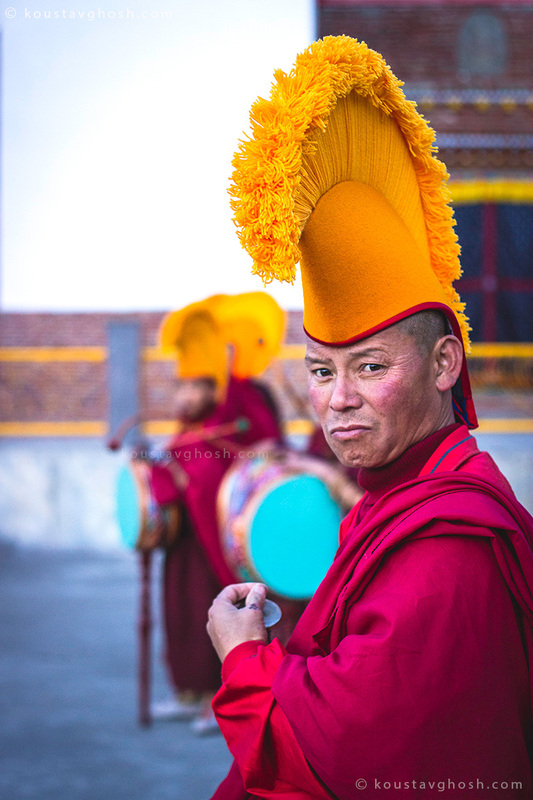 I went to the monastery and watched them preparing for the Cham dance. It was chilling cold outside. I couldn’t feel my hands sometimes as I had to remove my gloves for photographing. I feel uncomfortable to take photograph wearing woollen gloves. As the sun rose behind the hills they started their festival with their dance. 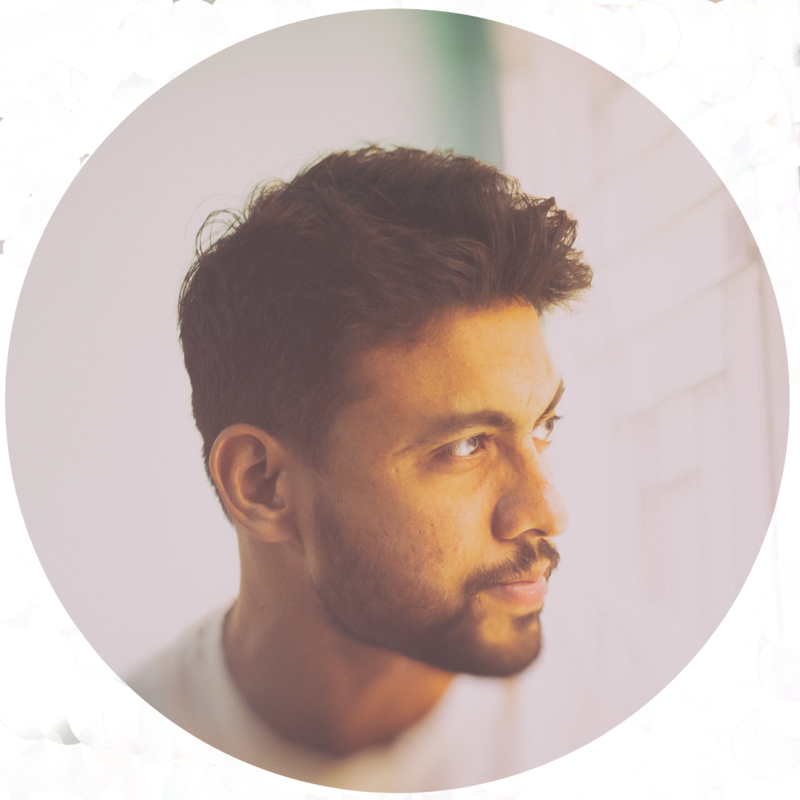 They portray different phases and situations of life through their dance. 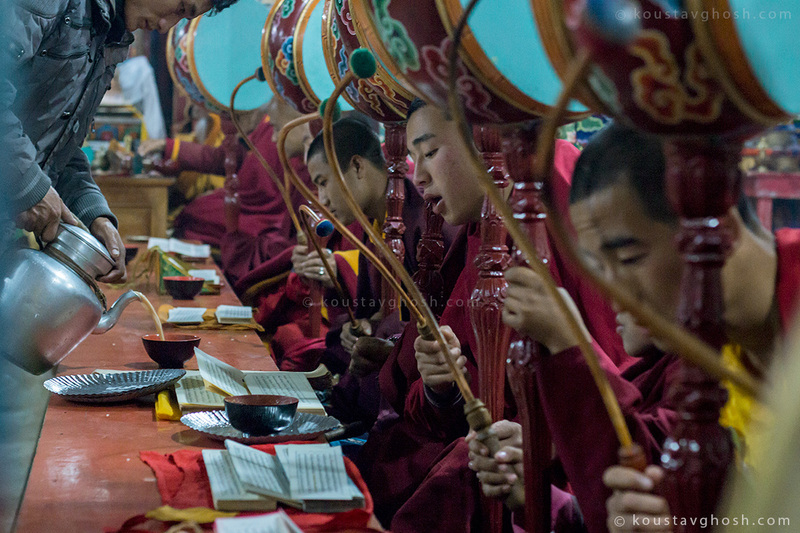 The young monks were also performing. Gradually the local people started to gather and watch the festival. During lunch time the dance stopped for an hour. The performers needed to have food as they were performing almost continuously but still not for a single moment they seemed to be out of energy. They performed throughout the day. After our lunch we went uphill to visit the New Ralang Monastery. This new monastery was made later to accommodate more monks. When we reached there it was empty as all the monks came down to the old monastery for the festival. We decided to re visit the monastery next morning. We came back and watched the rest of the festival. The next morning I wanted to see the sunrise from the new monastery. We woke up very early. We didn’t want to miss the first light. The moment we reached new monastery, the sun rose. The first light of the sun on the Kanchenjunga was majestic. We went inside the monastery and found very few monks busy in their work. The main temple was closed. 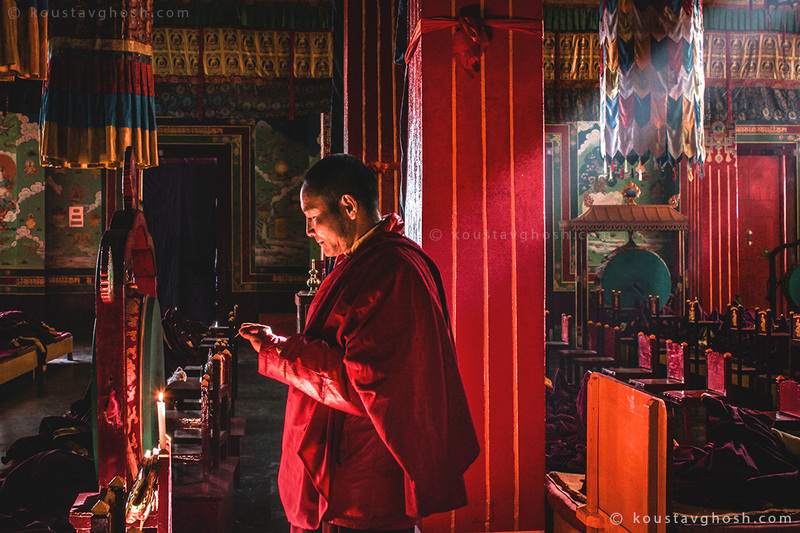 On asking the monk, he opened the door for us and let us photograph the inside. The inside of the temple was looking wonderful. We thanked the monk for his generosity and returned to old monastery. Now it was our time to wrap things up and return to our daily lives. Our vacation was almost over. I wished I could spend some more days there. It was such a beautiful and peaceful place, free from noise and pollution. 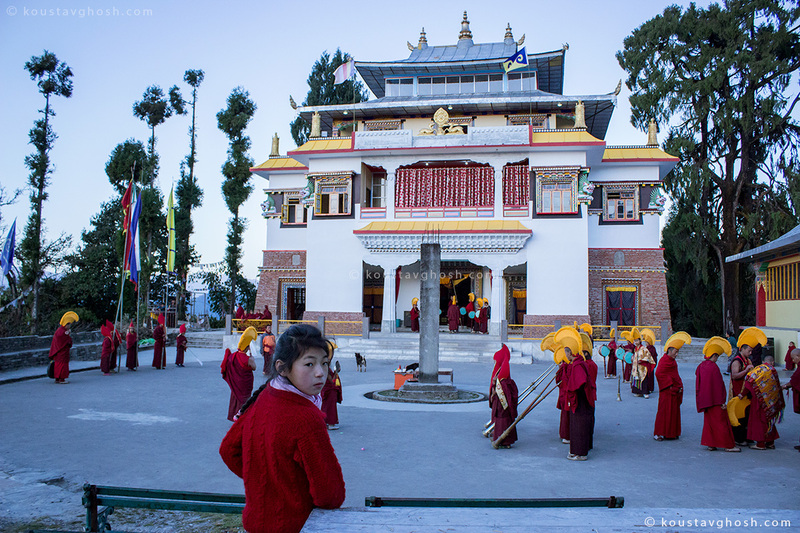 We came back to Ravangla on that day. Next morning we travelled to Siliguri to catch our return train. In the overnight train journey I was thinking of the place and their people only. I thought of going back to the place one more time. May be some other day, some other time with more enthusiasm and a peaceful mind. Till we meet again. 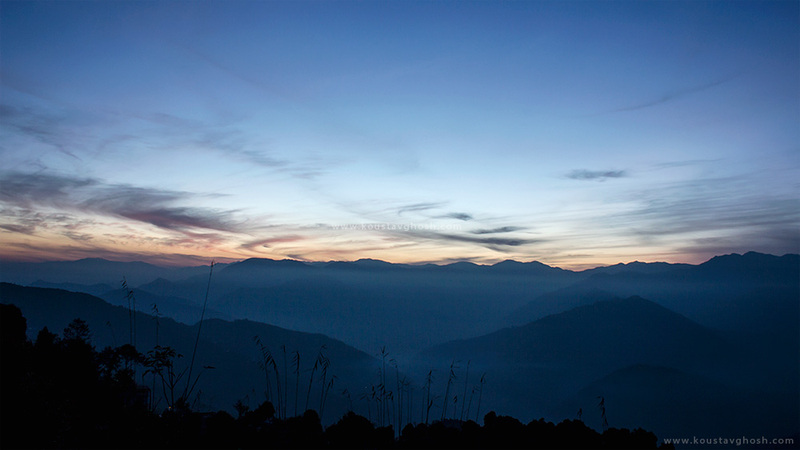 A view of the valley from Ravangla. 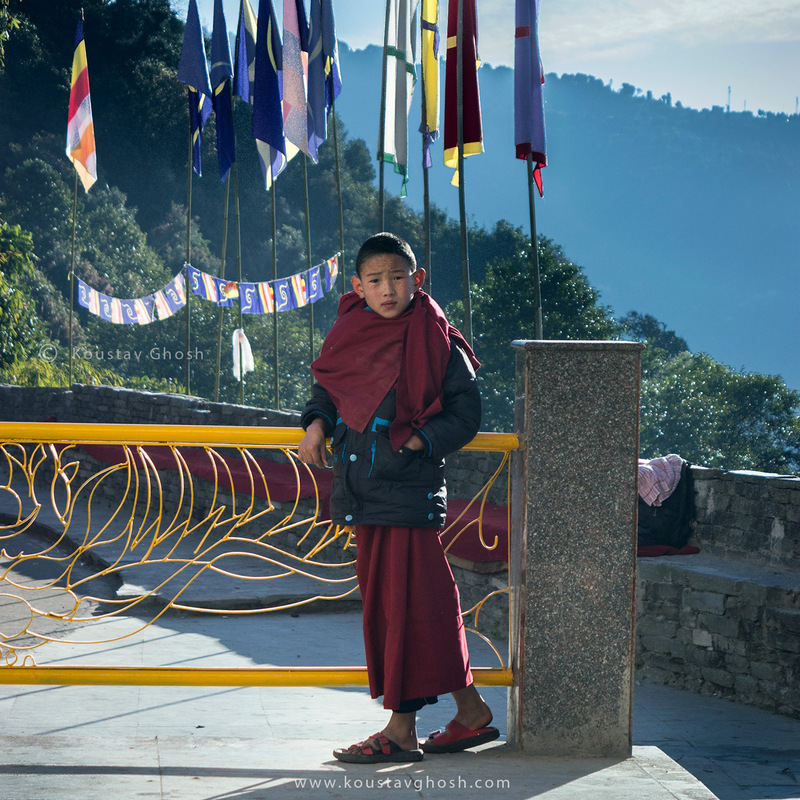 If you haven’t read my blog post about Ravangla from where our journey started, you can read it here. If you find my blog post interesting, feel free to share on any social medium. Please leave your comment below. Thank you.